US-made tear gas, manufactured by companies like Combined Systems Inc. (CSI), Defense Technology, and Nonlethal Technologies, continues to be used by governments including Egypt, Israel, Yemen, Bahrain and the United States to repress popular protest movements for social justice. In response, human rights advocates will protest again on Martin Luther King Jr. Day, January 16th, 2012, outside CSI’s Jamestown, Pennsylvania headquarters (see past Protests against Israel’s tear gas use). In advance of the protest, reports indicate that CSI has replaced the Israeli flag that previously flew alongside the US flag outside its headquarters with a Pennsylvania state flag. On December 9, 2011, in the village of Nabi Saleh in the West Bank an Israeli soldier inside an armored military jeep fired a tear gas canister at close range directly at the face of Palestinian protester Mustafa Tamimi during a protest against the expansion of Israeli settlements on Nabi Saleh’s land. Mustafa died from his wounds the next day. Protesters did not manage to collect the actual tear gas canister fired at him. However, residents of Nabi Saleh have collected samples of the types of tear gas canisters that the Israeli army uses against Nabi Saleh’s weekly protests, including the specific type of tear gas canister – same size and shape – that hit Mustafa. 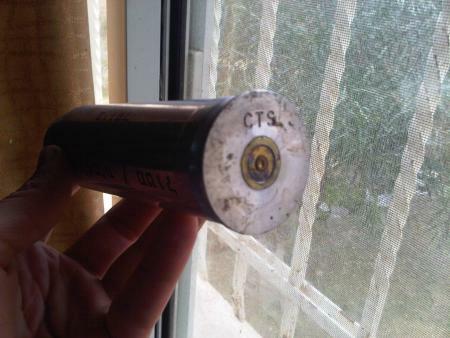 The type of canister that killed Mustafa can be seen in the January 11 and 13, 2012, photos below taken in Nabi Saleh by Bilal Tamimi. The canister has a headstamp on it that reads CTS. CTS stands for Combined Tactical Systems, a brand name of Combined Systems Inc., in Jamestown, PA. Adalah-NY received these photos from the Popular Struggle Coordination Committee. CSI canisters and tear gas, shot by Israeli soldiers during protests against Israel’s settlements and wall on Palestinian land, also caused the deaths of protesters Bassem and Jawaher Abu Rahmah in Bil’in, the severe injury of protester Tristan Anderson, a US citizen, in Ni’lin, as well as severe injuries to many other Palestinian protesters (more information on these protesters). CSI is the primary supplier of tear gas to the Israeli military as well as a provider to Israel’s police (and border police). Until a January 2012 change to it’s website, CSI listed Israeli Military Industries and Rafael Armament Development Authority as among its military customers and development partners (see old webpage). CSI’s founders, Jacob Kravel and Michael Brunn, are Israeli-Americans. In addition to ubiquitous CSI/CTS canisters found at Palestinian protests, evidence of CSI sales and shipments to Israel is clear. An April 30, 2008, cable available through Wikileaks from the US State Department in Washington DC to the US State Department in Tel Aviv requests clearance for shipment to Israel’s police of the following equipment from CSI: 1,000 Rubber Ball Hand Grenades, 1,000 Tactical Grenades Flash Bang, 1,000 Sting-Ball Grenades, 1,000 Flash Bang Training, and 1,000 Super-Sock Bean Bags. The shipment was part of a larger $5 million agreement between the Israeli police and CSI. An Israeli government website shows that on August 4th, 2011, the Israeli police purchased 6 million shekels ($1.56 million) worth of stun grenades from CSI without issuing a tender. The PIERS Export Database of US Trade activity is helpful in identifying CSI shipments of tear gas to a number of countries, including Egypt, Tunisia and Algeria (see further information below). However, searching PIERS does not turn up CSI shipments to Israel. The photo of a CSI container at right reveals two reasons. 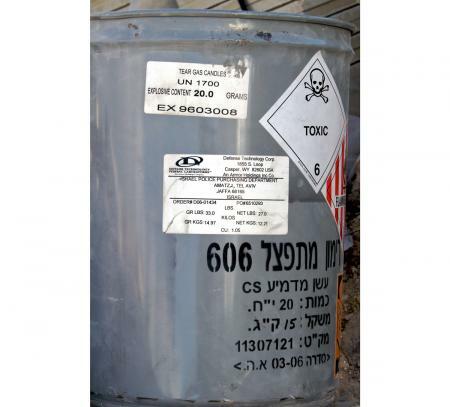 The bottom label in the photo shows that the tear gas container was shipped via Israel’s national airline El Al, and PIERS only tracks shipments by sea. Additionally, the bottom label shows the CSI container was sent to Israel’s Ministry of Defense by Interglobal Forwarding Services, in Bayonne, New Jersey. A search on PIERS for Interglobal Forwarding Services over the past year shows over 1,300 shipments, some evidently including tear gas, by Interglobal from the US to Israel’s Ministry of Defense. But the shipments are listed under Interglobal’s name, and do not show manufacturers’ names. The US company Defense Technology has also provided some tear gas to Israel’s police (see information on Defense Technology in the Middle East and Oakland below, and a photo of a Defense Technology tear gas container in Jerusalem below). CSI tear gas is also the primary tear gas that has been used by the Egyptian security forces to repress popular protests for democracy in Egypt over the last year, causing protester deaths and injuries. Amnesty International highlighted the shipment of CSI tear gas to Egypt in its December 6, 2011, call for the US government to stop sending tear gas and weapons to the Egyptian government due to tear gas-related deaths and injuries to Egyptian protesters. Using the PIERS database, Amnesty International documented three specific shipments of tear gas from CSI in the US to Egypt in 2011 that were approved by the US State Department, despite the Egyptian security forces’ record of using of tear gas to kill and injure protesters in efforts to crush protests. As additional documentation, a July 11, 2008, cable from the State Department in Washington DC to the State Department in Cairo available through Wikileaks requests information to finalize the shipment from CSI to Egypt’s Ministry of Interior of 20,000 CS Smoke Hand Grenades, 20,000 CS Smoke Long Range Cartridge, and 4,000 CS Window Penetrating Cartridges, together valued at $621,000. CSI canisters were also seen (for example at 27 seconds in this Tunisian video) and blamed for protester deaths in Tunisia. The PIERS database reveals an April 1, 2010, CSI shipment of 5.540 kilograms of “grenade cartridges” and “ammunition launchers” to Tunisia. PIERS also shows an April 8, 2011, shipment by CSI of 12,663 kilograms of “ammunition” to Algeria. There is some evidence of use of CSI tear gas by the Yemeni government against protesters. Other CSI customers include the Netherlands and Germany (information available via PIERS), and (via Wikileaks) Guatemala, India, Timor-Leste, Hong Kong, Argentina, Thailand, Trinidad and Tobago, Cameroon (via Israel), and Sierra Leone. A Corporate Watch report shows that the US company Defense Technology has provided tear gas to Israel’s police. Defense Technology is headquartered in Casper, Wyoming, and is owned by the UK arms giant BAE Systems. BAE Systems also owns the US arms company Armor Holdings and bought Federal Laboratories, another US company that previously provided tear gas to Israel, and other countries, and was the object of protests and lawsuits during the first intifada (See section on Past Deaths from Israeli tear gas). Tear gas canisters with Defense Technology and Federal Laboratories have also been used by the Yemeni and Egyptian governments against pro-democracy protesters. The city of Oakland has also used Defense Technology tear gas in its efforts to stop popular protests by Occupy Oakland. Occupy Oakland protester Scott Olsen, a former US marine, was seriously injured when he was struck in the head by an Oakland police projectile, very likely manufactured by Defense Technology. There is clear documentation, and State Department confirmation that the State Department approves sales of tear gas to foreign governments by US companies as “Direct Commercial Sales.” A US State Department webpage shows many examples in different years of State Department regulated and approved Direct Commercial Sales by US companies of tear gas to countries like Egypt, Israel, and Bahrain. Wikileaks cables also confirm the US State Department approval process for US tear gas sales, as have a number of statements by the State Department. However, in US government records of the US’s “Foreign Military Sales” (FMS), sales of military items by the US government to other governments, use line item descriptions that are too broad to identify whether items like tear gas are being sold by the US government under FMS. Most importantly, because US military aid (“Foreign Military Financing” or FMF) is not reported transparently by the US government, it is not possible for the public to know whether or not the billions of dollars of tax dollars given as military aid to countries like Israel, Egypt, Yemen and Bahrain are paying for US tear gas transferred to those countries through Direct Commercial Sales, or possibly through Foreign Military Sales.